“There is no doubt that the peasants of our country are abstemious and struggle a lot. They don’t aspire to have a high standard of living. They are just committed to producing crops to survive. We often exploit their poverty by tempting them to provide cheap clothes, coarse rice and education to their children. We said it before achieving our liberation and still we are telling it. But they don’t care about such promises. They don’t think that others will take care of them and keep them well. Huge funds come from abroad in their name, which are supposed to be spent for them. But they don’t waste time looking for it and they have no expectation regarding this. It makes no difference to them. Foreign aid doesn’t reach the villages. It stays in the city and is spent on fineries and rich foods. Villagers don’t get any benefit from it. If the flow of aid ends, the city people will die, but nothing will change in the villages. The villages will always survive. Modern trend is taking us away from our soil and roots. As the people are living in skyscrapers, their minds are also moving at the peak of mountain. They have no connection with the ordinary masses. Therefore I don’t think of contemporary art as this is nothing more than gimmick. My ordinary countrymen are not used to modern abstract art works. They ask, ‘what’s the picture about? Explain it, we haven’t understood.’ They think they need to be very smart or educated to realize it. It makes them feel inferior. It’s a new kind of taste to have modern abstract paintings in most of the drawing rooms. It has some decorative value. Cubists, abstractionists, Dadaists use triangular forms to make angular figures. This is a personal preference. But in my view this approach is not relevant as ordinary people find it difficult to understand. Many might not like that the life of peasantry could be the subject of paintings. But I feel how can we deny to make them subject of art who dedicate their lives to manage our food? They have been protesting the disparity for ages to express their sufferings. Many poems have been written on this as well,” this is how SM Sultan, one of the most celebrated painters of Bangladesh, expresses his thoughts about his fellow countrymen and his philosophy of art in ‘Adam Surat’ (The Inner Strength), a documentary film made on him and directed by Tareque Masud. Sheikh Mohammed Sultan, better known as SM Sultan, was the first painter of Bangladesh who received both international appreciation and recognition for his outstanding works. His paintings were displayed in the same exhibition with world renowned artists like Pablo Picasso, Salvador Dalí, Henri Matisse, John Brack and Paul Klee. He was declared as the Man of Asia by University of Cambridge in 1982. A bohemian and mystic, Sultan was a type by himself as a painter in the artistic tradition of Indian sub-continent. His works, the vigour and movement of brush, the gracefulness of the figures, their worldliness and sensual beauty, completely free from any sort of mystifying symbol apart from the inherent logic of aesthetics, bear ample testimony of Renaissance paintings. He chose peasants as his muse. His creations not only focus on underprivileged communities but also highlight their power of unity. His works depict their stoic valour, struggle for survival and unceasing commitment to the land. SM Sultan was born on August 10, 1923, in Masimdia village under Narail district to Sheikh Mohammed Mecher Ali and Maju Bibi and breathed his last on October 10, 1994, at Jashore Combined Military Hospital. Today, on the 95th birth anniversary of this master artist, ‘morning tea’ pays tribute to him by narrating the social and political interpretation of his wonderful works. Being the son of a carpenter, Sultan amazed many in his childhood by his exceptional talent in painting. But he faced the cruel face of poverty as he had to leave his study and flee to Calcutta (now Kolkata) in 1938. There with the help of Narail’s zamindar Dhirendranath Roybahadur he came in touch with famous art critic Hasan Shaheed Suhrawardy who helped him to take admission in Calcutta Art School in 1941 albeit Sultan didn’t meet the admission requirements. During his stay in Suhrawardy’s house he watched many of the world’s best paintings and read numerous books on the methods of prominent painters’ works. Very predictably, he failed to obtain any academic degree as his nomadic forays took him all across the Indian sub-continent. Sultan travelled far and wide, to the US, UK and France, and of course his intermittent sojourns in West Pakistan is also mentionable. But it was Narail, his hometown, where he came back time and again and finally settled down there. In his initial years as a painter he mainly portrayed beautiful landscape of East Bengal. Around 30 solo painting exhibitions of SM Sultan were held in different cities including Simla, Lahore, Karachi, New York, Washington, Chicago, Boston and London, which not only enriched his international repute but also familiarised Bengali art practice on the global stage. When Sultan saw that the promise of making a Bangladesh free from all sorts of discrimination was not kept and the ideals of the War of Liberation collapsed into mere words, he took up his brush. There was no way for a sensible artist like him to overlook the corrupt practice in a bourgeois state, which was divided along the lines of class. The exploitation of the majority by a few through the age-old category of ownership, no doubt, took an absolutist turn under the shadow of capitalism. In the hegemony of a feudal system where one economic class ruled over the other, he portrayed the battle of the oppressed against the oppressors. Sultan was introduced to cultural connoisseurs of the country through a solo art exhibition at Bangladesh Shilpakala Academy in 1976. He never estranged man from nature. Muscle-bound man appears aggrandized as he depicted them as spirited with the commitment to make sure the survival of the civilisation. His curvaceous woman is represented as one of the prime and soulful forces of country’s economic activities. His figures attain a rotundity which ultimately became a hallmark that separated him from other artists. His round, swirling strokes, puffing up the bodies inordinately, testify to a gesture towards inverse adoration. Sultan’s figures are larger-than-life entities, architects of their own fate, and in abeyance of propitious divinity. They are seen drenched in the glory of their own labour. His palette widely varied in both range and pitch. When he played with the tonality of colours the softer, tentative plasticity of these fecund strokes leaves no doubt in one’s mind that Sultan was preoccupied with rendering his pictorial planes with a temporality that is not specific to any historical time and space. One of sultan’s prominent characteristic was to represent the peasantry of Bangladesh by bestowing them with a muscular physic and strength. While explaining the reason of such presentation in an interview, he stated, “Farmers are the actual heroes of our country. Can a hero ever be weak? Thus they need to be muscular. They push in the blade of the plough into the rough land to harvest. Even though they are emaciated, skeletal and undernourished in reality, I want to imagine them as a symbol of strength. I hope for a prosperous life for them.” Sultan framed the country as one enormous village where he would plant the seeds of transformation by way of nurturing the future generation—the rural children—he believed, would thrive only through art and creativity. That is why he established his art school ‘Shishu Swarga’ at Kurigram on the outskirts of Narail town besides his favourite river Chitra to teach painting to rural children. 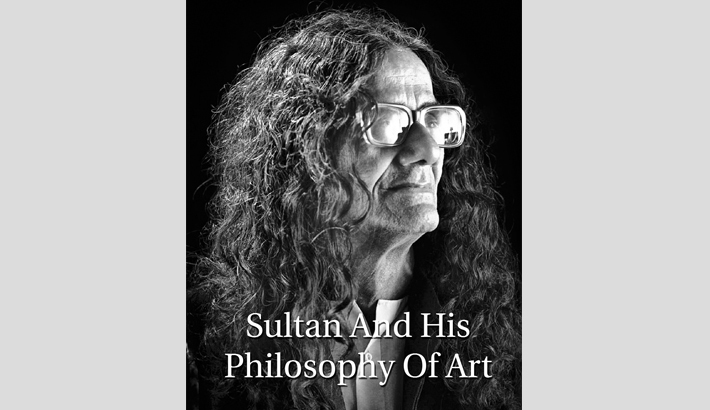 As a free-spirited artist SM Sultan’s soul was anointed with a restlessness that remained unchanged to the very end of his life. He lorded over a life of his own design in conformity to his own panache. He was made an ‘artist-in-residence’ by the Bangladesh Shilpakala Academy in 1984. Sultan received the Ekushey Padak in 1982, the Bangladesh Charu Shilpi Sangsad Award in 1986 and the Independence Day Award in 1993 for his outstanding contributions in the field of fine arts. Harvesting (1986), one of his major art works, is listed by the Bangladesh National Museum as one of its 100 renowned objects. SM Sultan had the courage to show how the oppressed could rise and claim the land they belong to. He had his eyes set on dislodging the dominant discourse of capitalism. He brought to fore how the peasants engage themselves in waging a symbolic war to establish their rights. As an artist Sultan devised his entire life as a component of humanity to portray the toiling masses. He envisioned a society against the existing oppressive system that bases itself on the concept of affluence and the city as the hub of achieving that. He was a painter who blended oriental and occidental style of art to bring modernism in Bangladesh’s art. Sultan will be remembered for re-introducing an art tradition that connects with the root involving underprivileged section of the society as long as Bengalis will vow to preserve their cultural practice.